BRITISH HISTORIAN DAVID IRVING was ambushed by eight Austrian Staatspolizei (Stapo) officers at gunpoint on November 11, 2005 when visiting Vienna to speak to university students on Adolf Eichmann, Joel Brand, and British code-breaking revelations. The arrest warrant had been issued 16 years earlier, November 8, 1989, at the written demand (Anzeige) of a Communist-front body, the Dokumentations-Archiv des Osterreichischen Widerstands (Document Center of the Austrian Resistance), issued the day before, as court records revealed. Mr. Irving was charged under Austria's 1945 "Verbotsgesetz" (Banning Law) with having uttered illegal opinions on history at a 1989 talk. 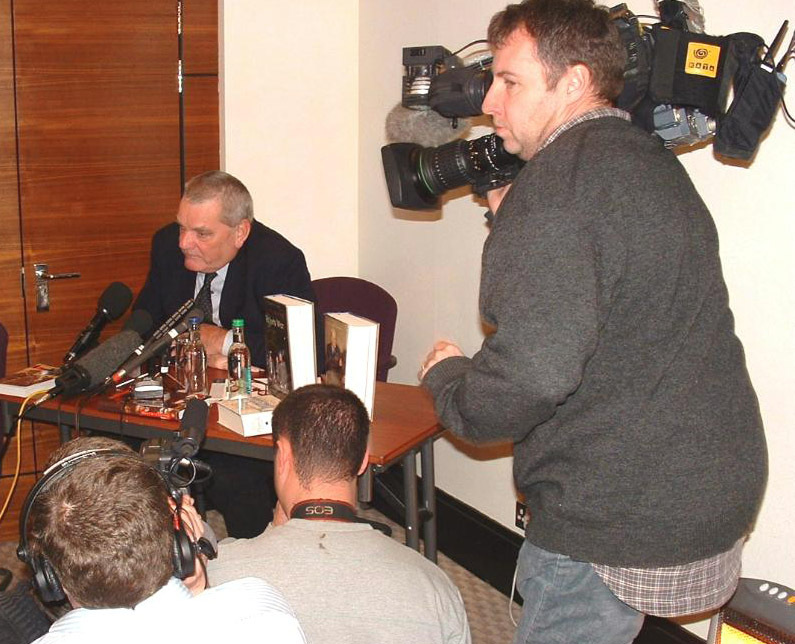 On February 20, 2006 at a show trial staged in Austria's largest criminal courtroom with 200 spectators, he was sentenced to three years in jail. 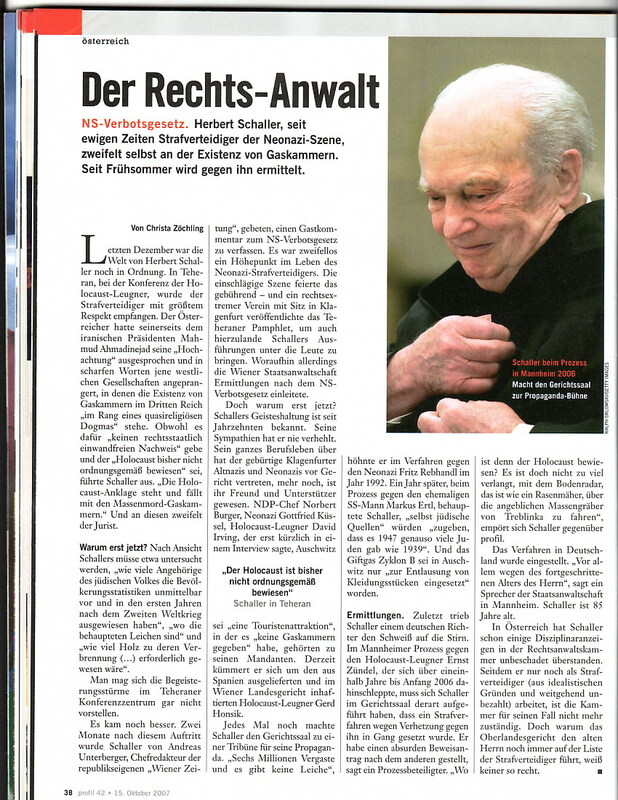 His lawyers triumphed in the Court of Appeal and he was released on Dec 21, 2006 after 400 days in solitary confinement in Austria's oldest jailhouse. How it all began: Volksstimme, Nov 8, 1989: Sperrfeuer gegen Irving - Zwei weitere Auftritte inzwischen verboten | and the communist Volksstimme: Nur noch vor 80 treuen konnte der neonazinahe Historiker' Montag nacht in Wien reden (German) - the next day the arrest warrant was issued. Nov 8, 1989: After a communist-inspired riot in Vienna the socialist government issued an Arrest Warrant against David Irving at the behest of the Dokumentationsachiv des österreichischen Widerstands (i.e., Dr Erika Weinzierl). Jan 2006, The Observer prints Malte Herwig's study of Mr Irving: "Hitler? Good in Parts"
A very filthy cell. . . I lie down and wait for the glaring ceiling light to go out. It stays on all night. 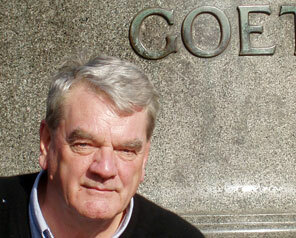 Feb 22, 2006: The Irish Times says the imprisonment of David Irving displays European hypocrisy towards Jews. 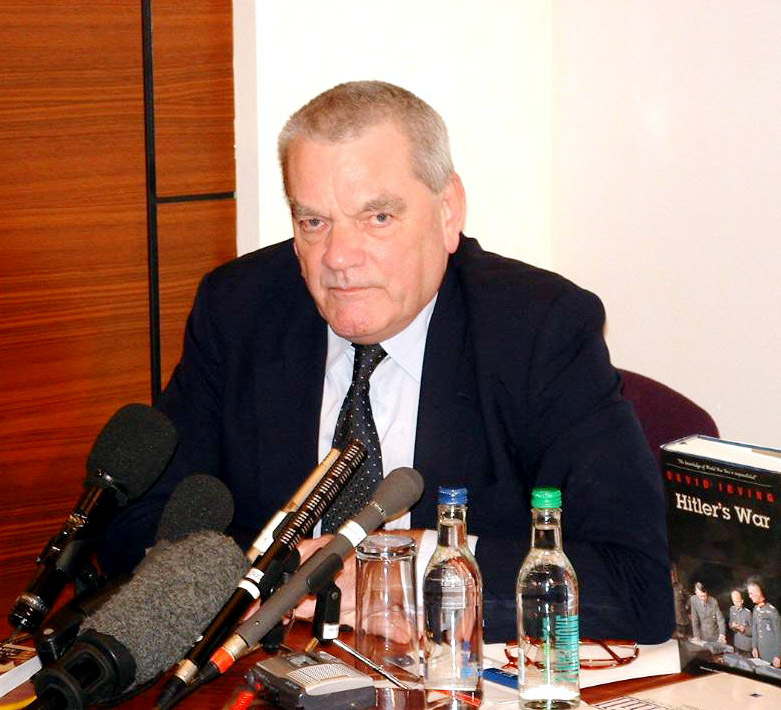 "I have read most of David Irving's works. He is a brilliant researcher, is partly mad, and is clearly bad. But those who say he denies the Nazi programme of genocide of Jews simply haven't read his writings." 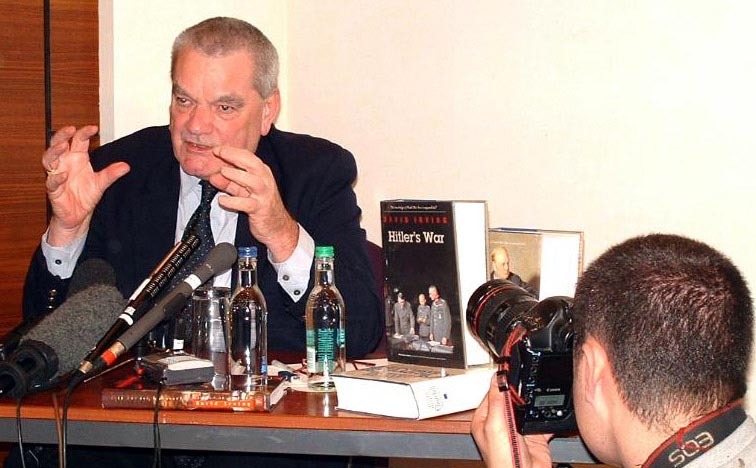 Der Spiegel asks a German historian, Hans-Ulrich Wehler, should British historian David Irving be placed behind bars? He says: "Pity for this Man is Out of Place"
BBC: Irving not remorseful after jail : David Irving complains he was jailed for expressing "wrong views"
David Irving: A Radical's Diary: The Appeal, and Release A very filthy cell. . . I lie down and wait for the glaring ceiling light to go out. It stays on all night. Here's an odd thing The result of the post-trial History News Network poll "Jail David Irving?" has been removed - but all the other postings have been left on | Flashback to Jun 2000: Australian poll, should historians be silenced? "I just finished listening to audio of a BBC reporter interviewing you after your release. What jackasses these people are!" 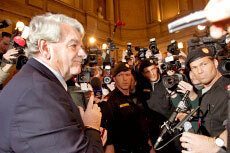 Canadian Online newspaper Orato exclusive: "Holocaust Historian David Irving Released From Prison: His First Interview From The Outside"
On Jan 7 the brilliant journalist Christopher Hitchens (right) on TV Ontario defended the right of David Irving not be imprisoned in Austria for his views. [audio link or Click this link and then "Christopher Hitchens" - each time we post the actual TVO link it is changed]. Contributions for Mr Irving's legal battle should be made via our Secure webpage. Contributions to the "David Irving Fighting Fund" can also be mailed to PO Box 1707, Key West, FL 33041, USA; or to Bente Hogh, 50 Sloane Street, London SW1X 9SN, UK. Mr Irving will personally acknowledge all. [Become a regular monthly supporter]. David Irving's legal attorney is Dr. Herbert Schaller, Verteidiger in Strafsachen, Gusshausstrasse 6, A-1040 Vienna, Austria. Telephone/fax no +43.1.505 2627.